Select the outcome, or response, variable of interest. This should be a binary variable, either a factor or an integer with two value (i.e., 0 and 1). The level in the response variable that is considered a success. For example, a purchase or buyer is equal to “yes”. Select one or more variables that can be used to predict the chosen level in the response variable. This could be a variable, an RFM index, or predicted values from a model (e.g., from a logistic regression estimated using Model > Logistic regression (GLM) or a Neural Network estimated using Model > Neural Network). To use the Profit and ROME (Return on Marketing Expenditures) charts, enter the Margin for each sale and the estimated Cost per contact (e.g., mailing costs or opportunity cost of email or text message). For example, if the margin on a sale is $10 (excluding the contact cost) and the contact cost is $1 enter 10 and 1 in the Margin and Cost input windows. If a filter is active (e.g., set in the Data > View tab) generate results for All data, Training data, Test data, or Both training and test data. If no filter is active calculations are applied to all data. Generate Lift, Gains, Profit, and/or ROME charts. Add code to Report > Rmd to (re)create the analysis by clicking the icon on the bottom left of your screen or by pressing ALT-enter on your keyboard. The single plot can be customized using ggplot2 commands (see example below)). See Data > Visualize for details. Predicted probabilities probabilities selected through Predictor are first converted to a class (e.g., a positive or negative outcome) using the values entered in Margin and Cost. It will be profitable to contact a customer if the predicted probability of response exceeds Cost / Margin. For example, if the break-even response rate is 0.1 and the predicted probability of response is 0.25 that customer will be assigned the label Positive. If, on the other hand, the predicted probability does not exceed the break-even response rate a customer will be assigned a Negative label. 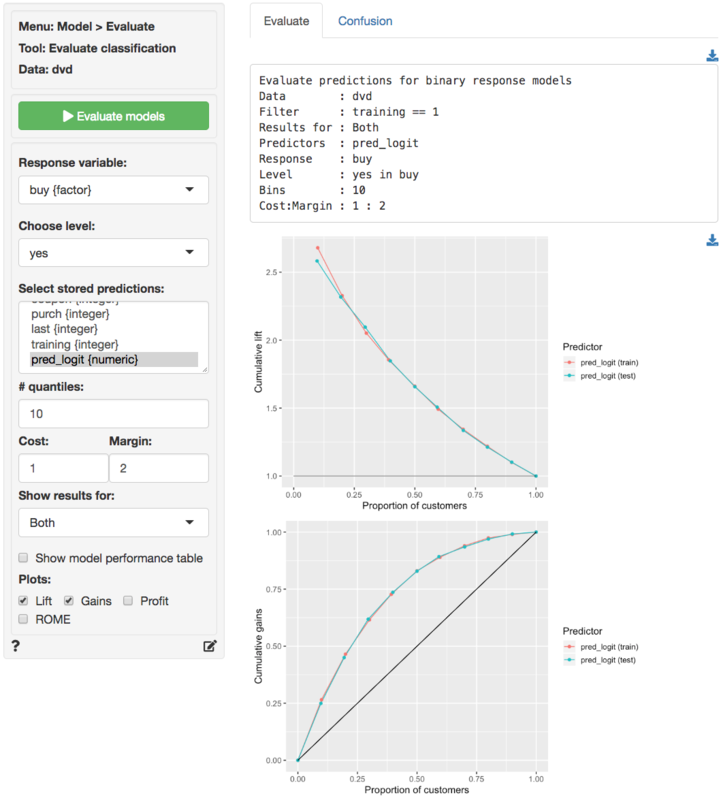 Once each prediction has been converted to a class label (i.e., Positive or Negative) the result is compared to the values of the response variable. The following key measures are shown in the generated table for each predictor. AUC Area Under the ROC Curve (AUC). ROC stands for Receiver Operating Characteristic. The plot can be further customized using ggplot2 commands (see example below)). See Data > Visualize for details. To download a table as a csv-files click the download button on the top-right of your screen. To download plots as png files click the download icon on the middle-right of your screen. The Lift and Gains charts below show little evidence of overfitting and suggest that targeting approximately 65% of customers would maximize profits. 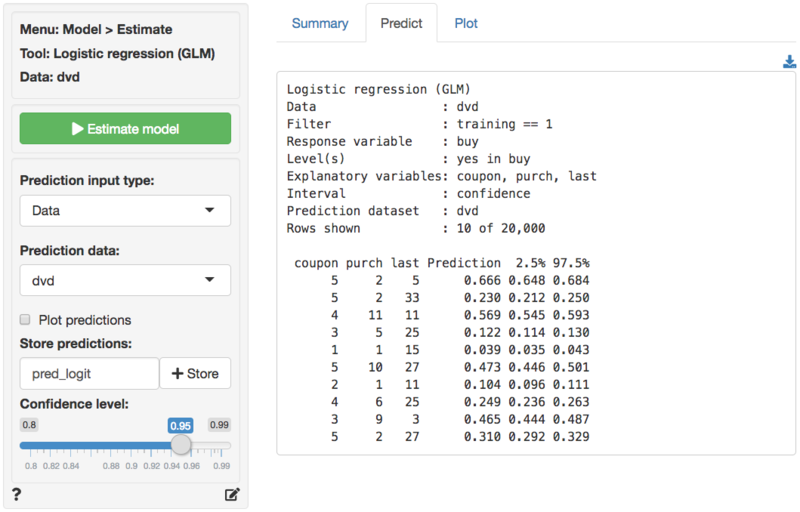 The prediction used in the screen shots above was derived from a logistic regression on the dvd data. The data is available through the Data > Manage tab (i.e., choose Examples from the Load data of type drop-down and press Load). The model was estimated using Model > Logistic regression (GLM). The predictions shown below were generated in the Predict tab.